One of my favorite parts of attending a con is the cosplay. Seeing people dressed like Superman or Batman or Princess Leia is a big part of the experience. You don’t have to wait in lines or hope they’ll stop long enough for you to snap a picture because they want to have their picture taken and are happy to strike a character appropriate pose. Some spend months creating the perfect look, scouring stores for the right fabric for their shirt or the perfect buckle for their belt. These cosplayers stand out and draw lots of attention, but even the guy who just throws on a Superman cape is a part of the fun. It’s all about celebrating the things we love, no matter how we look. Or is it. I just read an article over on Mens Fitness called “NY Comic Con: Flabby Versions of Your Favorite Superheroes!”(I removed the link because Mens Fitness has taken down the original post! Yay!) It started with a brief write-up about how cons are a “bully-free zone” but went on to showcase photos of cosplayers complete with snarky captions that turned the author into the con’s biggest bully. I understand that the site is all about getting those six-pack abs, but going out of the way to make fun of people who don’t have them, that I don’t understand at all. A con should be a bully-free zone. It is the one place where anyone can be a superhero. You don’t have to have six pack abs nor do you have to be tall, dark and handsome. And honestly, no one really cares if you’ve got the physique to perfectly replicate Thor or Slave Leia. Well, the bully at Mens Fitness cares, but his words and his attitudes have only the power we allow them. If you’re a geek or a nerd or whatever you want to call it, then you’ve likely been dealing with guys like this author your whole life. He was the one who looked down on you for no other reason than that you were being you. Your hair was wrong. Your jeans were wrong. You were too smart. You liked the wrong movie. You hung out with the wrong crowd. The reason doesn’t matter because no matter what you do “this guy” is always out there ready to rain on your parade and ruin the fun. But we’re not kids in high school anymore. We’re adults and these cons belong to us. They belong to anyone who ever brought a Star Trek lunchbox to school. They belong to guys who say “Engage!” as they pull out of the driveway. They belong to parents making Star Wars pancakes and kids running around with lightsabers. They belong to the people in line for midnight showings of Iron Man and Spider-Man, people who watched the final shuttle launch with tears in their eyes, and to everyone who is currently bleary-eyed from playing Batman: Arkham City for two days straight. They belong to anyone who wants to celebrate what they love not some guy who thinks it’s cool to make fun of us. They belong to us. Thank you for this. Been bullied my whole life for being who I am. Now I am my own superhero and a-holes like this aren't going to ruin it. Thanks again, you rock. Long live cosplay! I couldn't have said it better myself, Nicole! To all haters of con-goers, cosplayers and nerds: You mess with one of us, you mess with all of us!!! In retrospect, I wish I hadn't clicked on the link giving them the site traffic. I will admit I have been snarky once or twice about cosplayers (nobody's perfect) as well as been on the receiving end, BUT that usually has more to do with the craftsmanship of the costume. (I know, I know. That is still no excuse.) What upset me with Men's Health is that some of those costumes genuinely looked amazing, and yet they decided to poke fun at the person for non-costume related things. The sickly Iron Man comment was extremely uncalled for. Thank you so much for the kind words. I was so frustrated by the article, it was hard to not just scream in all caps. And @Pixie, sending traffic their way makes me cringe, but I figure in the end maybe it'll stop someone from doing something so nasty in the future, so it'll be worth it. Great post, Nicole – as a cosplayer who isn't in the best shape, that article really pissed me off. With all of THAT being said, my kids get picked on A LOT. I do not teach them to ignore it. I teach them about empathy. Feeling sad for the ignorant children at school who don't have parents who love them enough to dress in character or explain homework in the voice of a Dalek. WE give people the power to hurt us. Whoever wrote this article is a very sad and shallow person and personally, I don't feel hurt by the article, and as a culture I don't think any of us should. I am proud that those REAL con costumers are on our team. This article resonates with me. A photo of me in costume at DragonCon went viral back in September and early into this month. 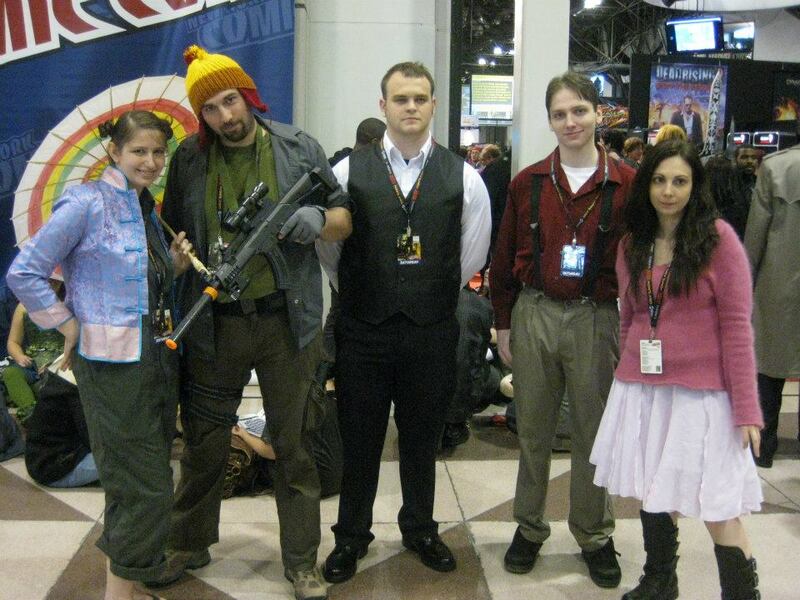 It won some cosplay-of-the-day on a few nerdery sites. I know, I know, I shouldn't read the comments. I only did on one site and though my feelings weren't personally wounded when someone commented that I really should have found another character that better matched my physique I was indignant. I didn't respond there, but I will do so here. Do you know how empty con halls would be if the only people allowed to wear costumes had to match the genetically-enhanced perfectly-developed bodies of superheroes? Television and film almost never have average-sized characters, and when they do it's almost never women. The actress who played Seven of Nine on ST:Voyager who already was a size zero, who already had inhumanly perfect cheekbones and stature was STILL forced every day into an extremely uncomfortable corset in order to be allowed to play that role. Movies use CGI on even the most conventionally "perfect" actors to smooth out "flaws". Graphic novels and even literature rarely offer heroes or main characters who are above average in size or even average! I for one adore seeing cosplayers, regardless of body type or countenance dawning the cloak of their favorite character. And con folk tend to be pretty decent. I got only compliments on my costumes, no barbs, no tittering. Would it have been acceptable if the article highlighted various costumes and their cosplayers if there had been constructive criticism about how out of shape the wearer was? Bravo to those of you who were the picked on, shy girl, and overcame that to still enjoy cosplaying. Truly, the majority of people at cons support cosplayers, no matter their physique. I don't think criticism of how out of shape a cosplayer might be is appropriate at all. We each know our own physical faults and definitely don't need to have them pointed out to us along with a giant picture for the world. It's one thing to ask for criticism, it's another thing to have it forced on you. I love this! I love attending cons, but am a little too shy to cosplay. I take my kids and we have a blast hanging out with and seeing all cosplayers. Cons should and always have been for me, "bully-free" and a place for everyone. That's another reason I feel comfortable taking my family. I say "Cheers" to the brave men and women who cosplay and "thank you "for making our con experiences that much more enjoyable! To the Mens Fitness writer *tongue stick out* to you!! Have to admit "Avengers Dishevel" made me giggle. The rest – especially the Tony Stark one – were iuncalled for. While I agree with your sentiment I do think there is one thing people wishing to Cosplay need to bear in mind: take your body shape into account when choosing a costume. Noone wants to see an enormous belly wrapped in tight spandex and lycra. The Wonder woman outfit is definitely out if you're a 300 pound guy, no matter how much you want it. You could probably pull a pretty god Hulk, Beast or any number of other characters I don't know enough about comics to recognise though. And even if you do have the body, some characters are maybe inappropriate. There will always be the Slave Leias, but there were a heck of a lot of White Queens at Gencon who were barely decent. Cosplay appropriately and all is good. Thank you, Nicole. I think it's important that we have a "safe zone" and the con is ideal for "our kind." I was interviewed at NYCC and I actually mentioned that it's worse now that I'm an adult; I would not have survived as kids do now with fb/social media. Maybe it'll mean tougher kids but maybe not considering there are cases of suicide because people can't tolerate the harassment they face for being different. I found this article through a link on twitter. Thanks for posting it. It means a lot. Am now following you on twitter.